EHEIM UV 350 ULTRA VIOLET WATER STERILISER. YOU ARE LOOKING AT A EHEIM UV 350 ULTRA VIOLET WATER STERILISER. USED IN EXCELLENT CONDITION & FULL WORKING ORDER. MAY HAVE ODD MARKS/ SCRATCHES TO THE CASING BUT NOTHING MAJOR. The sterilizer UV Eheim Reeflex 500 (9 Watts) is intended for aquariums water sweet and sea of 300 to 500 litres water. Type Stérilisateur UV. For 300 to 500 litres aquarium. Without specific indications, the point nearest relay proposed by Mondial Relay will be chosen by default. 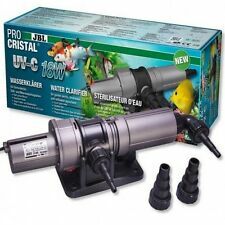 (Sterilizer UV JBL ProCristal 18w for fresh water and sea water aquarium. JBL ProCristal QuickConnect ) to increase the power. Purge: to avoid the presence of air bubbles in the unit, lift the water sterilizer while the pump is running in such a way that the water connection where spring water is maintained to the top for a few seconds. Benefits of the EHEIM reeflexUV. reeflexUV should only be used in conjunction with the filter, in order to reduce small organisms (microorganisms, algae spores etc.) in the aquarium. There are 3 models available for aquariums from 80 up to 800 litres. Sterilizzatore UV JBL ProCristal 18w per acqua dolce e Acquario marino. Type Stérilisateur UV. Parziale sterilizzazione (preventivi, germi): bacino fino a 18000 litri. Sterilizzazione totale (verde acqua. ): bacino fino al 1800 litri. Dank seiner Aluminium-Reflektor ist dieser Eheim Sterilisator sehr viel effektiver als eine herkömmliche Sterilisator. Für klares Wasser und gesunde Fische ist der Sterilisator UV Sprachmodulen 500 empfohlen. Pour une eau claire et des poissons en bonne santé, le stérilisateur UV Reeflex 500 est recommandé. Grâce à son réflecteur en alluminium, ce sterilisateur Eheim est beaucoup plus efficace qu'un stérilisateur classique. Per acqua cristallina e pesci sani, si consiglia lo sterilizzatore UV Reeflex 500. Type Stérilisateur UV. Per un acquario da 300 a 500 litri. (JBL ProCristal QuickConnect ), die Leistung zu erhöhen. 2 m Kabel robuste Kautschuk mit Schutzleiter und Stecker 2P T. Sicherheit bei der Eröffnung des Gerätes mit automatische Abschaltung des UV - C Lampe. Sans indications particulières, le point relais le plus proche de chez vous proposé par Mondial Relay sera choisi par défaut. Stérilisation totale (eau verte.) : bassin jusqu'à 1800 litres. Utilisation en bassin de jardin . Para agua limpia y peces sanos, se recomienda el esterilizador UV Reeflex 500. Type Stérilisateur UV. Para acuarios de 300 a 500 litros. Únase a nosotros en nuestra página web. Esterilizador de 500 acuario EHEIM Reeflex UV. Beneficios de la reeflexUV EHEIM. reeflexUV debe ser utilizado junto con el filtro, para reducir pequeños organismos (microorganismos, esporas de algas etc.) en el acuario. Es gibt 3 Modelle für Aquarien von 80 bis zu 800 Liter zur Verfügung. Ideal auch für die Zucht Panzer, da das Risiko einer Infektion verringert. EHEIM Sprachmodulen UV 500 Aquarium Sterilisator. AUTO-OFF: Automatische Sicherheitsabschaltung beim Lampenwechsel. ReeflexUV deve essere utilizzato solo in combinazione con il filtro, al fine di ridurre i piccoli organismi (microrganismi, spore di alghe ecc.). nell'acquario. "Contatta il venditore"pulsanti su questo elenco. Stérilisateur à 500 Aquarium EHEIM Reeflex UV.